"None of them understand me… I'm supposed to play music!" Yay! Disney-Pixar have unveiled a full-length official trailer for Pixar's Coco, the first musical and next animated movie from the beloved animation studio. The story involves a young boy named Miguel who gets lost in the world of the dead while searching for his great-great grandfather. The voices include newcomer Anthony Gonzalez playing Miguel, along with Benjamin Bratt, Gael Garcia Bernal, and Renee Victor. This certainly looks like Pixar's most colorful movie yet, my goodness. We also finally get a glimpse of the dead world and all the various skeleton characters he meets. This looks like it's going to be fun and emotional and a very potent reminder of the love families have. Though we still haven't actually heard a real song from the movie yet, I'm totally sold anyway. You can also watch the first teaser trailer for Pixar's Coco here, or the short film "Dante's Lunch" here. 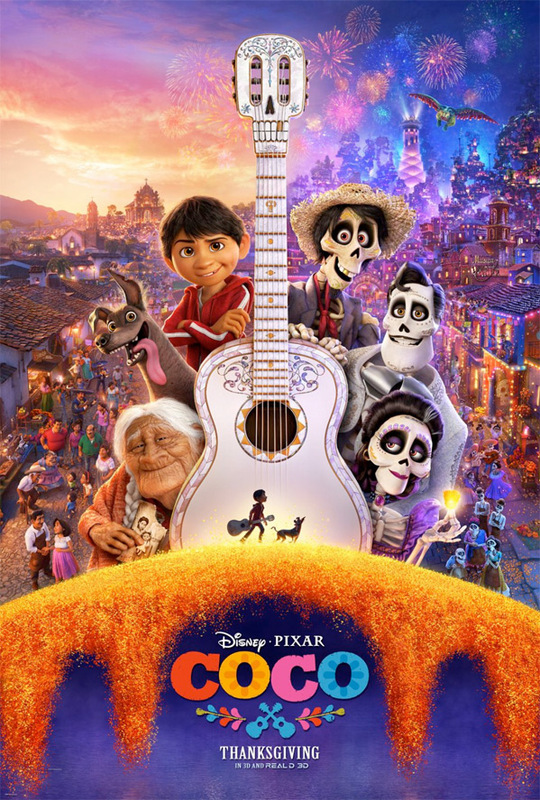 The short synopsis is quite vague: Pixar's Coco follows a 12-year-old boy named Miguel who sets off a chain of events relating to a century-old mystery, leading to an extraordinary family reunion. Coco is directed by filmmaker Lee Unkrich (of Toy Story 2, Monsters Inc, Finding Nemo, Toy Story 3) and co-directed by Adrian Molina, who also wrote the screenplay. As explained in the EW article: "This is a story we want to share with the world, but it’s also been particularly important to us that when the Latino community sees the film, that it resonates and it feels like we got it right, and that’s what we’re really trying to do. We all feel the gravity." Disney will release Pixar's Coco in theaters in 3D starting on November 22nd, 2017 this fall.